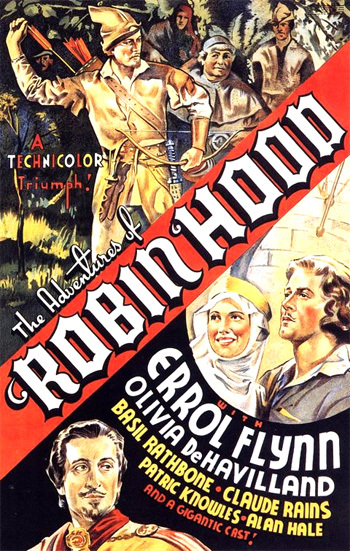 The Adventures of Robin Hood (1938) is one of the greatest, most colorful costume dramas, swashbucklers, and romantically-tinged adventure films in film history. After the icy restrictions placed on the film industry following the establishment of the Production Code Administration (Breen Office) in the mid 1930s, Warner Bros. Studios decided to find relief from censorship by bringing about a renaissance of the historical-costume adventure film, with swordplay, sweeping action, and romantic charm. It expertly tells the story of the heroic Robin and his Sherwood Forest followers, who saved England from royal treachery by scheming nobles during the absence of the crusading and captured-ransomed King Richard the Lion-Hearted. And it tells the fairy-tale romance with nostalgic chivalry, colorful pageantry, simple righteousness triumphant over villainous and evil might, and spectacular action. There were at least six silent era attempts at the story. The Reginald de Koven-Harry B. Smith light opera version of Robin Hood was originally presented in 1890. And Douglas Fairbanks starred as the infamous outlaw hero and Wallace Beery as Richard the Lion-Hearted in an early silent version of the film directed by Allan Dwan - Robin Hood (1922), reportedly the most expensive film made up to that time (at $1.6 - 2 million). In addition to his daring stunt work (sliding down a drapery, engaging in archery and swordsmanship, and other acrobatic feats), Fairbanks wrote the screenplay (with pseudonym Elton Thomas) for the fast moving, epic silent film filled with medieval pageantry. The spectacle includes superb casting of memorable characters, a light-hearted, but spirited story, exciting dueling and action scenes requiring extensive stunt work, and the ideal love team of de Havilland and gallant Flynn with their witty and tender romantic scenes together. [It was their third of eight films together - the first two were Captain Blood (1935) and The Charge of the Light Brigade (1936) - and this was the first of their pairings in color.] Flynn did most of his own dueling and other action stunts except for the expert archery shooting, and was coached by fencing master Fred Cavens. Oscar-winning Erich Wolfgang Korngold (who won his second award) created the richly orchestrated, lush score that effectively provided the musical backdrop for the action and the rich settings, and the literate screenplay was co-written by contract writer Norman Reilly Raine (who won the Academy Award in 1938 for the prestigious The Life of Emile Zola (1937)) and Seton I. Miller (who was co-author of The Sea Hawk (1940), another Flynn swashbuckler). The film was nominated for four Academy Awards: Best Interior Direction (Carl J. Weyl), Best Original Score (Erich Wolfgang Korngold), Best Film Editing (Ralph Dawson), and Best Picture, and lost only its Best Picture recognition to Frank Capra's You Can't Take It With You (1938). 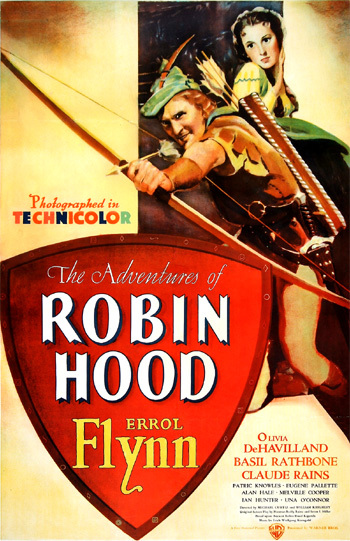 Disney produced two Robin Hood versions: The Story of Robin Hood and his Merrie Men (1952) (Disney's second made-in-Britain production) and the animated Robin Hood (1973). And Hammer Studios produced three Robin Hood movies in the 1950s and 1960s: Men of Sherwood Forest (1957), Sword of Sherwood Forest (1960), and A Challenge for Robin Hood (1968). The 1938 film had a sequel of sorts, Robin and Marian (1976), with Sean Connery and Audrey Hepburn as middle-aged lovers. And Kevin Costner starred as the title character in Kevin Reynolds' Robin Hood: Prince of Thieves (1991). 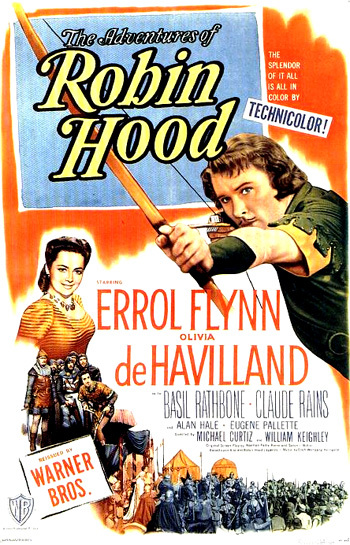 During the titles and credits, the viewer is informed that the quasi-historical story of the rogue outlaw is "Based Upon Ancient Robin Hood Legends," although the film also borrowed from old English ballads and Sir Walter Scott's 1819 novel Ivanhoe, with its emphasis on the oppressive treatment of the Saxons by the Norman knights. A proclamation is read by a town crier to a crowd that news has arrived from Vienna that King Richard the Lion Hearted (Ian Hunter) has been captured in Austria by Emperor Leopold and held for ransom while returning from the Third Crusade in the Holy Land. The news at Nottingham Castle is welcomed by Richard's brother, the sly, scheming, evil and despotic Prince John (Claude Rains) - who has usurped power and declared himself Regent of England (heir-apparent to the British throne) by self-appointment during the King's absence and imprisonment. Ruthless Sir Guy of Gisbourne (Basil Rathbone) - the ruler of the city of Nottingham, the ineffectual High Sheriff of Nottingham (Melville Cooper), and other ruling Norman nobles and knights in the upper class (with Prince John) plot to brutally subjugate and overtax the Saxons (pretending that the money will pay the King's ransom) and take over power in the kingdom. Yes, and death from hunger if I don't, thanks to you and the rest of you Norman cutthroats at Nottingham Castle...You can beat and starve our Saxons now, but when King Richard escapes, he'll take you by the scruff of the neck and fling you into the sea. From this day on, I'll follow only you. Why there isn't a poor Saxon in all of Nottinghamshire that doesn't know and bless Sir Robin of Locksley. Take me as your servant. Why in all the forest, there isn't a hunter as good as me. I ask no pay, just to follow you. The great cold hall of Nottingham Castle, the stronghold of Sir Guy Gisbourne, knew an unaccustomed warmth this night, for Prince John and his friends were met to celebrate a promising future. Well, this is what we Normans like - good food, good company, and a beautiful woman to flatter me. Prince: Why, you like him, don't you? Prince: Is that the only reason for liking him? Prince: Nay, I not force you, my lady. But he's our most powerful friend in these shires. And he's already in love with you. If I could promise him marriage to a royal ward, it might help my plans. Prince: Of course. You're a very wise young woman. ...a reckless rogue who goes around the shires stirring up the Saxons against authority, and he has the insolence to set himself up as the protector of the people. The Prince orders his Sheriff of Nottingham to immediately capture Robin and hang him. Let him approach...By my faith, but you're a bold rascal. Robin. I like you. What a pity your manners don't match your looks, Your Highness. Involved in the evil machinations of the Prince, the Bishop of the Black Canons (Montagu Love) retorts: "I'd advise you to curb that wagging tongue of yours!" Lady Marian is unimpressed by Robin's treasonous activities, even when Robin boldly announces resistance: "We Saxons aren't going to put up with these oppressions much longer." Prince John explains the reasons for the taxes - to collect the ransom to release the King from imprisonment by Emperor Leopold. He also announces he has deposed Longchamps as Regent and appointed himself to take charge.